An Oscar for UKAPress Author Kevin Brownlow. Huge congratulations go to renowned UKA Press author and film documentarian Kevin Brownlow (The Search for Charlie Chaplin, Winstanley, Warts and All and How It Happened Here) who, together with Francis Ford Coppola, Jean-Luc Godard and actor Eli Wallach, will receive a Motion Picture Academy Award Honorary Oscar for his contribution and dedication to the preservation and restoration of silent film in Hollywood on 13th November 2010. Since starting his own film collection at the age of eleven, Kevin Brownlow has worked in the cinema – either as a filmmaker in his own right, or as a historian. He entered documentaries in 1955 with World Wide Pictures and became an editor in 1958. 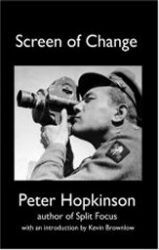 In the 1960s, he worked as editor with Lindsay Anderson onThe White Bus and was supervising editor on Tony Richardson’sThe Charge of the Light Brigade (1968). With Andrew Mollo, he directed two feature films, It Happened Here (1964) released by United Artists, about an imaginary German occupation of England, and Winstanley (1975), made for The British Film Institute, set in the aftermath of the English Civil War. In 1980, with David Gill, Brownlow produced and directed a thirteen-part television series, Hollywood, based on Brownlow’s book The Parade’s Gone By. Thanks to the series, Thames sponsored the showing of Brownlow’s reconstruction of Napoleon as part of the 1980 London Film Festival. The five-hour Abel Gance epic was accompanied by a full orchestra playing a specially commissioned score composed and conducted by Carl Davis. The outstanding success of the event demonstrated to a modern audience the power and excitement of a period in filmmaking so long dismissed as primitive and inaccessible.